While grabbing a few bags of raspberries and blueberries from the freezer at Whole Foods yesterday I noticed frozen cranberries. It occurred to me that I’ve been neglecting this nutritious berry lately and thus snatched a couple bags with thoughts of blending them into my smoothie the next day. The cranberries seemed to synchronistically come along as I was still doing a little detox work and eating lightly to “recover” after a mini-vacation. Something I like to do whenever I deviate from my normal eating habits for a couple of days to a week. Cranberries are rich in vitamins and antioxidants, but perhaps best known from their cleansing powers. They help clear toxins and plaque buildup from the body by cleansing the organs involved in elimination and the lymphatic system. Cranberries are also known for offering protection against urinary tract infections, supporting the immune system, benefiting the cardiovascular system, and for their anti-cancer properties. There’s even a popular cranberry juice detox diet as a testament to their cleansing prowess. Throw a little lemon into the mix and you’ve got a one-two cleansing punch. This smoothie isn’t overly filling, you could add a banana to beef it up, but is light and refreshing and helps things move along if you know what I mean. Place all the ingredients into your high speed blender and blend on high until the desired consistency is reached, usually around for 30-45 seconds. Please leave a comment below if you try this blissful smoothie. Happy Blending! I had limited ingredients so I made my own version of this. Basically it was the first part of ingredients minus the apple and I used a kiwi instead. It was tangy and delicious! Hi Anna, I love it when people improvise with what they have available. That’s what smoothie making is all about. Thanks for sharing you’re unique version of this smoothie. Sounds wonderful BUT…I am borderline diabetic and 40 grams of sugar is too much. Any suggestions? Either omit the apple or use 1/2 apple to reduce the sugar, Susan. OK, now I’d like to download the 15 Smoothies you offered. Thanks. I just opted you into my newsletter to receive my smoothie recipe eBook. You’ll receive a confirmation email shortly. Assuming you got this recipe to print as a PDF. Delicious! This is tangy and gets better with each sip. I tried adding some other spice, too, (pinch of cardamom), and subbed an Asian pear. Love it, as did my 4 year old when he was nursing a bad cold. Great to hear you and your 4 year old enjoyed this smoothie :) Adding cardamom and subbing in an Asian pear was a nice touch. “Bliss” indeed….Best smoothie ever! My add-ons are 1/2 cup coconut milk and 1/4 cup fresh pineapple chunks. I used cinnamon instead of nutmeg, preferring that flavor, and sweetened with maple syrup. Yum! That might be the best comment ever :) Love how you adjusted the ingredients to suit your preferences. I’d like to make the smoothie but I don’t have a blender, so is there a way to make it with out a blender? You’ll need some sort of blender to make this or any smoothie. Either a regular old counter top blender, an immersion blender, or even a food processor. I have been ill for a long time and takes sooo many meds. I am excited to try this and your other smoothies. I have heard many good things about the amount of nutrients packed in such a small amount with a big punch. Thank you for the recipe! 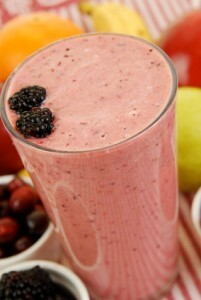 Good luck getting off those meds and feeling great with nutritionally loaded healthy smoothies! I would love to try this recipe but cannot source either fresh or frozen Cranberries. Would it be possible to reconstitute dried cranberries ? Not sure how well dried cranberries will reconstitute, but you can try, or just use them in this recipe as is. Nice, Nikkia :) Healthy foods including smoothies often taste great!